Whether you’ve been spinning your wheels in a relationship, struggling with solutions to a tricky work problem, or just have no clue what to make for dinner, feeling stuck is one common — and annoying — part of life. To get “unstuck” and allow the creative juices to flow, you must first still your mind. Mindfulness practices, such as meditation, yoga, tai chi, or even mindful walking, help calm the mind of incessant thoughts so you feel more present. When you are fully present, you have a more calm and focused mind, and this is often the most fertile ground for original, creative ideas to spawn. Studies have found that yoga can have profound effects on the brain. In one study, brain matter was measured before and after a 12-week Iyengar yoga program. After the program, the participants, who were new to yoga and had no previous psychiatric or neurological disorders, displayed changes in their brains — including a decrease in the amygdala (stress center) and an increase in the right-frontal lobe (creativity center). Changes in the brain directly cause changes to your thoughts, including increasing the ability to generate new and creative ideas. This backbend places you upside down, and University of California, San Diego psychobiologist Roger Cole, Ph.D., says, “The stimulation [created by wheel pose] creates a burst of adrenaline, which gives a better and healthier jolt to the system than an afternoon triple latte.” This surge of adrenaline may help spark creative ideas. Rockstar pose, also known as Wild Thing, is an inverted variation of a 3-Legged Downward Dog, where the raised leg is bent and dropped to the side, rotating the pose upside down. “This backbend flips us over and gives us a new perspective by forcing us to see the world upside down,” explains Elise. “When we look at things a little (or a lot) differently, we open up a whole new world of creativity. We shift our perspective from the ‘norm’ in order to truly innovate anything.” Be sure to repeat the pose on the opposite side. 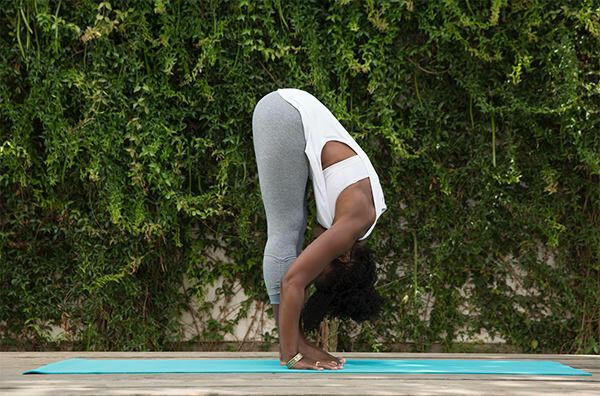 Other inversions include the headstand, handstand, and forearm balance, where the body is flipped upside down and the head is below the heart. Since inversions are challenging, your mind must become present and focused in order to accomplish the pose and not tip over. This focus helps clears the mind of mental chatter and creates the space for creativity to flow. Pigeon is a hip-opening floor posture that mimics the splits but keeps the front knee completely bent so that you are sitting on your front foot. Keeping the front shin on the mat, shift your front foot to the side slightly, as long as it feels good on the knee, and shift your weight back to feel the stretch in the hip. Take in a deep breath while opening up the chest, then exhale your torso forward, bringing your forehead, arms, and palms to the mat. These two poses serve as rhythmic transitions in a tabletop position. Begin on all fours with a flat back. For Cow Pose, inhale and allow the belly to expand toward the floor and open the chest, lift your tailbone, and look up toward the ceiling. On the exhale, move into Cat Pose. Round your back, bring your chin to your chest, and curl your tailbone toward your knees. “In Cow Pose, we open up our heart, receiving positive energy and turning our attention upward toward joy and creativity,” says Elise. “In Cat Pose, we turn our attention inward and connect strongly to our physical and emotional center, thereby examining ourselves and what we have to express.” Take full inhales and exhales as you move slowly back and forth between the two. The next time you feel stuck, try these poses to get your creative juices flowing and tell us how it goes! If you’re new to yoga, check out Beachbody’s new video series, 3 Week Yoga Retreat, to learn the fundamentals of yoga.